Melanoma occurs when certain cells within the skin grow in an uncontrolled, abnormal, manner. Melanoma begins in the pigmented or dark cells in the skin, called melanocytes. These cells produce melanin, the pigment that gives skin its color. According to the American Cancer Society, more than 70,000 will be diagnosed and nearly 9,000 people will die from the melanoma in 2011. Melanoma is the third most common form of skin cancer but the most serious. Coronal PET/CT (A) and axial PET/CT (B), CT (C), and PET (D) images acquired in patient with melanoma. Small focus of moderately increased 18F-FDG uptake corresponded to small soft-tissue nodule on CT (yellow arrows). Biopsy confirmed melanoma, and subsequent surgery for solitary metastasis was performed. New developments in molecular imaging technologies are dramatically improving the ways in which melanoma is diagnosed and treated. Research in molecular imaging is also contributing to our understanding of the disease and directing more effective care of patients with melanoma. 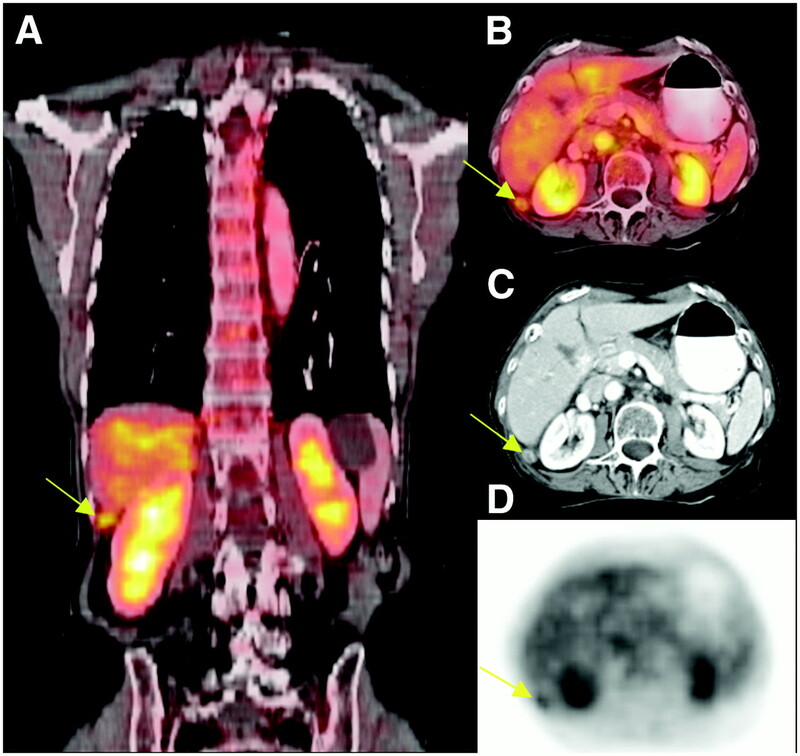 The most commonly used molecular imaging technologies used to diagnose and guide the treatment of melanoma are and positron emission tomography (PET) scanning, which is often used in conjunction with computed tomography (CT) scanning and lymphoscintigraphy. ﻿How is PET used for melanoma? Diagnose and stage: by determining the location of the cancer and where the cancer has spread in the body. Plan treatment: by determining a site that is appropriate for biopsy and in research studies helping select the best therapy based on the unique biology of the cancer and of the patient. Evaluate how the cancer responds to treatment. Lymphoscintigraphy is a procedure that provides images of the lymphatic system, a network of small channels similar to blood vessels that circulate fluid (called lymph) and cells (lymphocytes) of the immune system throughout the body. Lymph nodes, which act like a filter for foreign bodies such as germs, viruses and pollen, are located along this network. Lymphoscintigraphy helps identify the first few or sentinel lymph nodes that filter lymph fluid from the melanoma site and those most likely to be affected by cancer. The procedure involves injecting a tiny amount of radioactive particles (Technetium-99m sulfur-colloid) at the melanoma site. Depending on the site of the melanoma, images are then taken with a gamma camera of the patient’s arms and underarms, legs and groins, head, neck and chest, or other areas. The radiotracer gives off energy in the form of gamma rays that can be detected by the gamma camera. The camera produces images that reflect the amount of radiotracer absorbed throughout the lymphatic system. Using these images, a hand-held probe as a guide, a physician removes only the lymph nodes that have absorbed the radiotracer. Lymphoscintigraphy is a valuable tool for mapping where melanoma might spread to other parts of the body. Because melanoma can travel throughout the lymphatic system in unexpected ways, lymphoscintigraphy is helpful in directing the surgeon to potentially cancerous areas that may have otherwise been overlooked. Images generated by the procedure allow physicians to remove only sentinel lymph nodes, sparing patients from undergoing unnecessary removal of normal lymph nodes.